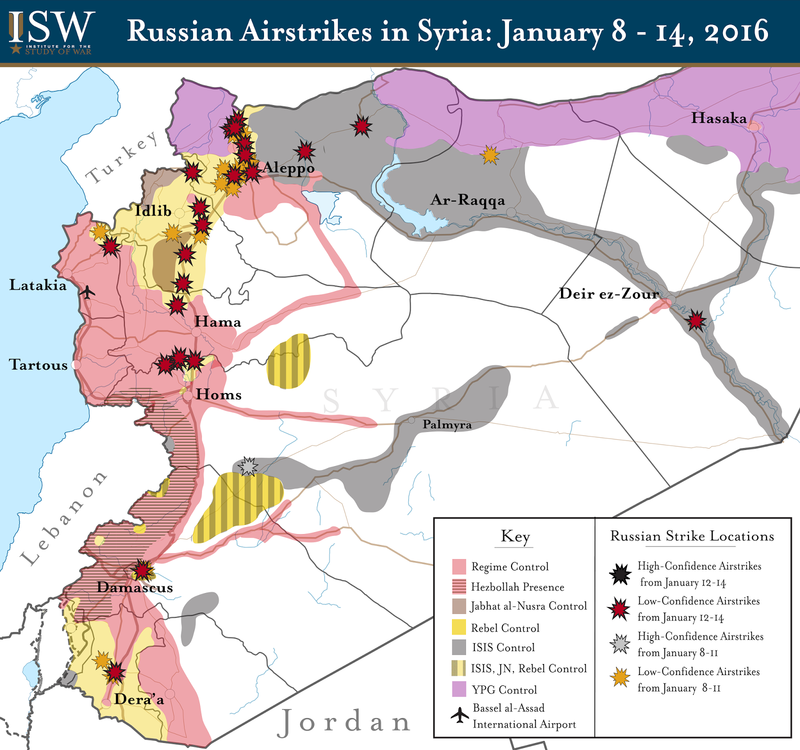 Key Takeaway: The Russian air campaign continued to target opposition-held terrain in an effort to solidify regime gains and increase negotiating leverage in the days immediately prior to the Geneva talks on January 29. Russian warplanes targeted over 40 separate locations in Aleppo, Idlib, Latakia, Hama, Homs, Damascus and Deir ez-Zour Provinces from January 26 – 28. 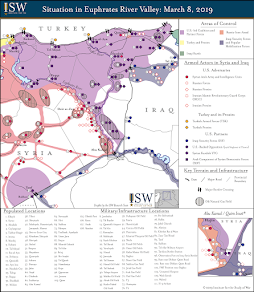 Russia’s intervention has significantly changed the situation on the ground, enabling significant regime victories in Aleppo, Latakia, and Dera’a and placing the regime in a superior negotiating position after suffering a number of meaningful losses to both the armed opposition in Idlib and ISIS in Eastern Homs in early- and mid-2015. Russian warplanes continued to support the regime’s clearing operations in Northeastern Latakia and target locations in Western Idlib, likely to set conditions to seize the strategic town of Jisr al-Shughour and secure regime control over the high ground in the Jebel al-Akrad and Jebel Turkmen mountain ranges. The Russian air campaign also continued to target opposition-held positions in Northwestern Aleppo and supported regime efforts to tighten the siege on the opposition-held pocket in Northern Homs. In the south, regime forces continued their offensive in Dera’a with the support of Russian air power after fully capturing opposition-held Sheikh Meskin on January 25. UK Envoy for Syria Gareth Bayley stated that Russian assistance in the Sheikh Meskin operation “reveals the hypocrisy of Russian targeting in Syria,” and that “this blatant targeting of opposition groups is deeply concerning, particularly as it comes just days before UN-led negotiations for a political settlement leading to transition in Syria.” The UK envoy also criticized Russia for the way Russian warplanes targeted the town, which has essentially left the city leveled. Russian warplanes continue to indiscriminately target civilian-populated areas, incurring high numbers of civilian casualties. The Russian air campaign targets ISIS-controlled territory in Northeastern Aleppo, ar-Raqqa, and Deir ez-Zour at the expense of civilian casualties. The activist organization Raqqa Slaughtered Silently reported that the majority of Russian strikes that target ISIS-held Raqqa City hit civilian-populated residential neighborhoods, while no more than 15 percent actually target ISIS’s strongholds in the city. Russia continues to aggressively posture against NATO from both Ukraine and Syria while casting itself as a constructive actor in both conflicts. U.S. European Command (EUCOM) accused Russia of destabilizing Europe by violating international norms and named deterring Russian aggression as its strategic priority. Moscow announced plans to form three new military divisions in western Russia to counter NATO. Russia is also reportedly developing an airbase near the Turkish border in northwestern Syria, an expansion of its military footprint in the Middle East that threatens to reignite its conflict with NATO member Turkey. France and the U.S. nevertheless signaled their intent to lift sanctions against Russia this year if it fulfills its commitments under the February 2015 ceasefire agreement in Ukraine. The U.S. held senior-level talks with both Ukraine and Russia to discuss plans for elections in separatist-held southeastern Ukraine, a key Russian demand within the ceasefire agreement. Russia has used superficially democratic tools to cloak its aggression throughout its Ukraine campaign and again seeks to use controlled elections to legitimize its occupation of Ukrainian territory. Western pressure on Kyiv to support the separatist elections as new Russian hardware reportedly enters the conflict zone reflects the additional leverage Moscow has gained by intervening in the Syrian Civil War and posturing as a partner against ISIS. Russia is courting anti-EU and anti-NATO opposition parties across Europe in order to assert itself as a rival center of power on the continent. Congress ordered the U.S. Director of National Intelligence to conduct an investigation into the Kremlin’s connections with far-right and far-left opposition parties in the EU that are opposed to Brussels. Russian efforts to cultivate ties with European opposition parties extend beyond the EU. Moldova’s pro-Russian opposition launched a wave of anti-government protests on January 20 calling for snap elections and the resignation of the newly-appointed pro-European prime minister. The Kremlin, which reportedly hosted Moldova’s pro-Russian opposition leaders in the buildup to the protests, likely seeks to capitalize on the corruption scandals plaguing the ruling pro-European faction in order to reverse the former Soviet republic’s Western geopolitical trajectory. Russia has made similar overtures to the anti-NATO opposition in Montenegro, where the pro-European government faces a possible vote of no confidence on January 27. Russia’s deputy foreign minister met with opposition leaders in Montenegro to discuss the promotion of a possible referendum on the Balkan country’s planned NATO accession. 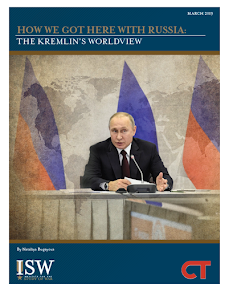 In tandem with its efforts to revise international norms in Ukraine, Russia’s outreach to anti-EU and anti-NATO opposition movements advances its strategic objective of expanding its sphere of influence in Europe at the expense of the U.S. and allied governments. Key Takeaway: The Russian air campaign in Syria enabled strategic gains in the regime’s longstanding effort to buffer its coastal heartland in Latakia from January 23 - 25. Russian strikes targeted opposition-held positions along the frontline in both Jebel al-Akrad and Jebel Turkmen mountain ranges in Northern Latakia, facilitating the regime’s seizure of the town of Rabi’ah, the last major opposition-held town in the province on January 24. The regime’s clearing operations in northern Latakia were enabled by Russian air support and were also reportedly guided by Russian advisers on the ground who likely contributed to the operation’s success. The regime’s consolidation of territory in northeastern Latakia comes after the seizure of Salma by pro-regime forces on January 12, which penetrated the opposition’s defensive line and left opposition forces vulnerable to further regime gains. The Russian air campaign has prioritized the preservation of regime-held territory, especially on the coast and in the central corridor, since its inception. Russia began its military intervention shortly after opposition forces began advancing in northeastern Latakia, and the threat to the regime’s heartland likely precipitated Russia’s military effort in Syria. Regime advances in Latakia also apply increasing pressure on opposition forces in neighboring Idlib province, an opposition stronghold. Russian airstrikes also allowed pro-regime forces to fully recapture the town of Sheikh Meskin in Dera’a province on 25 January following several weeks of clashes with opposition forces. Russian forces also sought alternate ways to support regime ground operations as the air campaign continues to be forced to sustain multiple fronts. The Russian Ministry of Defense (MoD) claimed to conduct strikes using Tu-22M3 long-range bombers against targets in Deir ez-Zour province from January 22 - 24. Russia has not claimed the use of Tu-22s since December 8, when Russia similarly targeted opposition- and ISIS-held terrain simultaneously. The deployment of long-range bombers may indicate that the existing fleet operating out of Bassel al-Assad Airport is not sufficient to sustain the current rate and distribution of strikes against both opposition- and ISIS-held territory. Russian warplanes have demonstrated a concerted effort against ISIS since the group’s advance on regime-held parts of Deir ez-Zour City on September 17; however, Russian indiscriminate targeting continues to incur high numbers of civilian casualties, and Russian operations aimed at degrading the armed opposition have continued unscathed. Russian warplanes targeted opposition-held territory in Aleppo, Idlib, and Dera’a from January 23 - 25. Russia provided military aid to Kurdish forces via helicopter in northwestern Aleppo on January 25. Russia’s shipment of weapons to Kurdish forces northwest of Aleppo City marks a new stage in Russia’s effort to strengthen ties with Kurdish elements, and will increase pressure on opposition groups operating in the area. Increasing Russo-Kurdish cooperation can disrupt US partnerships with Kurdish forces in other parts of Syria, introduce the potential for Turkish military reaction, and exacerbate Kurdish-Arab tensions in Aleppo province as Kurdish forces attempt to advance on Arab-dominant terrain. Although Russia attempts to present itself as a constructive actor in Syria, it continues to prioritize the preservation of the Assad regime without concern for civilian lives, ethnic tensions, or regional stability. 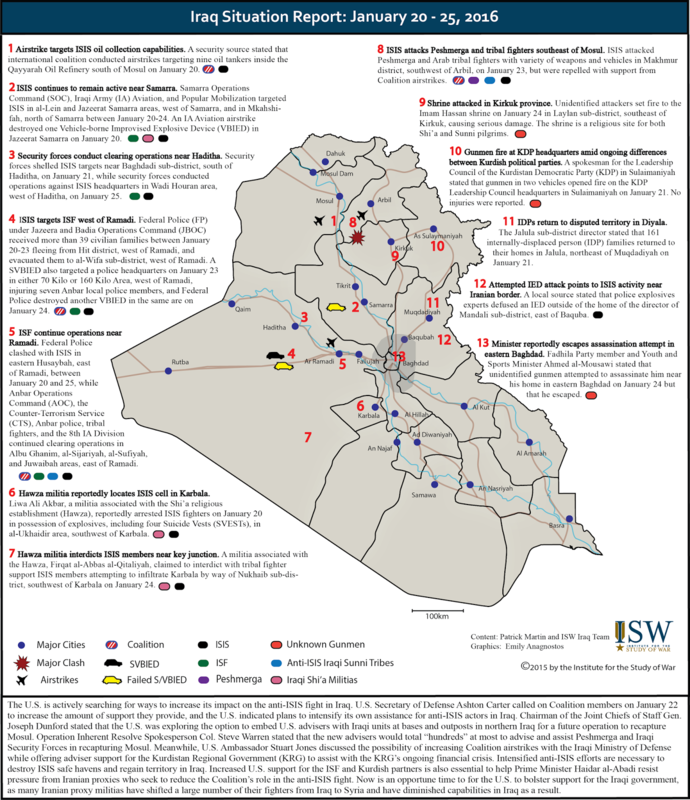 Key Take-Away: The U.S. is actively searching for ways to increase its impact on the anti-ISIS fight in Iraq. U.S. Secretary of Defense Ashton Carter called on Coalition members on January 22 to increase the amount of support they provide, and the U.S. indicated plans to intensify its own assistance for anti-ISIS actors in Iraq. Chairman of the Joint Chiefs of Staff Gen. Joseph Dunford stated that the U.S. was exploring the option to embed U.S. advisers with Iraqi units at bases and outposts in northern Iraq for a future operation to recapture Mosul. Operation Inherent Resolve Spokesperson Col. Steve Warren stated that the new advisers would total “hundreds” at most to advise and assist Peshmerga and Iraqi Security Forces in recapturing Mosul. Meanwhile, U.S. Ambassador Stuart Jones discussed the possibility of increasing Coalition airstrikes with the Iraqi Ministry of Defense while offering adviser support for the Kurdistan Regional Government (KRG) to assist with the KRG’s ongoing financial crisis. Intensified anti-ISIS efforts are necessary to destroy ISIS safe havens and regain territory in Iraq. Increased U.S. support for the ISF and Kurdish partners is also essential to help Prime Minister Haidar al-Abadi resist pressure from Iranian proxies who seek to reduce the Coalition’s role in the anti-ISIS fight. Now is an opportune time to for the U.S. to bolster support for the Iraqi government, as many Iranian proxy militias have shifted a large number of their fighters from Iraq to Syria and have diminished capabilities in Iraq as a result. The Russian air campaign continued to concentrate in Deir ez-Zour Province on January 20 - 22 in response to recent ISIS advances against regime forces in the northwestern outskirts of Deir ez-Zour City. Russia’s increase in strikes in Eastern Syria coincides with reports of the deployment of approximately one hundred Russian soldiers and engineers to the Qamishli International Airport in Northeastern Syria. Turkish intelligence and other local Syrian sources claimed that the Russian military personnel arrived at the facility in order to expand the airfield to enable the operation of Russian fighter jets and cargo planes. The use of Qamishli would provide Russia with closer access to Deir ez-Zour Province, where the regime is coming under increasing threat by ISIS. 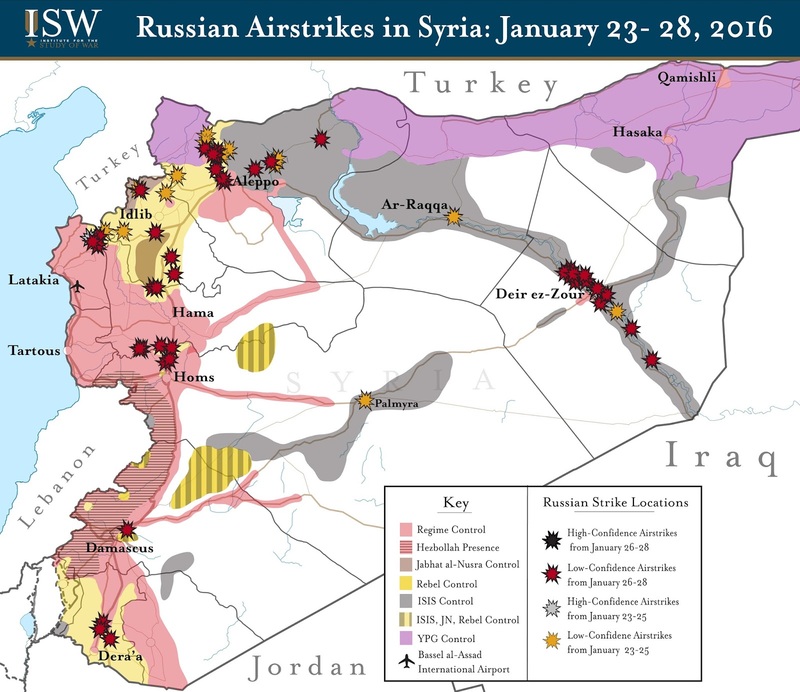 Russia continues to primarily use its air operations to ensure the preservation of the Assad regime, bolstering the regime’s battlefield position against the Syrian opposition and ISIS. Russian airstrikes have previously targeted both opposition forces and ISIS along Syrian Kurdish YPG frontlines in Aleppo and ar-Raqqa Provinces, facilitating Kurdish advances. Russia may intend to expand this relationship as indicated by reports that Russian personnel met with representatives from the YPG, a key U.S. ground partner, in order to discuss further deployments in Northeastern Syria. Russia could use coordination with the YPG to both undermine U.S. ground partnerships in Syria and threaten Turkey along its southern border. Russian personnel were similarly reported to have deployed to the Kuweires Airbase east of Aleppo City on January 22 in order to inspect the airfield. Use of the Kuweires Airbase would allow Russian to position itself to take advantage of U.S. efforts to sever ISIS’s access to the Turkish border in Northern Aleppo. Russia likely intends to compete with U.S. anti-ISIS operations in both Eastern Syria and Aleppo as it seeks to assert itself as a leading power in the fight against ISIS. Key Takeaway: Russian air operations shifted eastward on January 18-19, targeting ISIS-held terrain in Homs, ar-Raqqa and Deir ez-Zour Provinces following a major attack on Deir ez-Zour City by ISIS. ISIS launched an offensive against regime positions on the northwestern outskirts of Deir ez-Zour on January 17, seizing two villages and several military installations under the cover of a major sandstorm that reportedly grounded both regime and Russian aircraft. Russian warplanes subsequently shifted operations away from opposition-held terrain in Aleppo, Idlib, Hama, Homs, Damascus, and Dera’a Provinces in order to target ISIS-held positions along the Euphrates River north and south of Deir ez-Zour City on January 18. The shift in Russian air operations serves to forestall the immediate defeat of regime forces in Deir ez-Zour City, one of the last remaining regime outposts in Eastern Syria. Russia previously carried out its first humanitarian aid drop in Syria on January 15, claiming to deliver over 22 tons of humanitarian aid to besieged regime positions in Deir ez-Zour City. The aid operation comes amidst renewed diplomatic pressure by the international community to lift sieges on civilian populations in Syria. Local sources could not confirm whether the aid was humanitarian or military supplies. The impunity of Iraqi Shi’a militias also undermines the cohesion and sovereignty of Prime Minister Haidar al-Abadi’s government. The Basra offices of major Iranian proxy militias, including Badr Organization, Kata’ib Sayyid al-Shuhada (KSAS), Kata’ib al-Imam Ali, and Nujaba Movement, rejected the presence of an armored brigade on January 17 that PM Abadi ordered to Basra to clamp down on rising criminality and tribal violence. The rejection came after a confrontation in Shatt al-Arab district in southeastern Basra Province, when gunfire was exchanged between KSAS members and an Iraqi Army unit at a checkpoint. A combination of the need for ISF units on the front lines against ISIS along with protests from proxy militias likely led to the brigade’s withdrawal from Basra on January 19. Iraqi Shi’a militia abuses against Sunnis in Muqdadiyah on January 11 also infuriated the Sunni Etihad bloc, who decided to boycott the government for at least two parliamentary and cabinet sessions and demanded the disarmament and disbandment of unspecified militias in Diyala province. 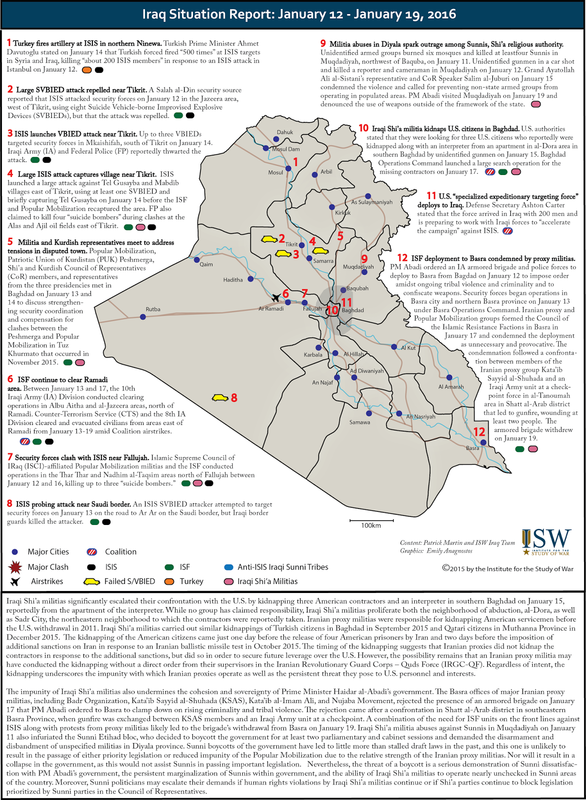 Sunni boycotts of the government have led to little more than stalled draft laws in the past, and this one is unlikely to result in the passage of either priority legislation or reduced impunity of the Popular Mobilization due to the relative strength of the Iranian proxy militias. Nor will it result in a collapse in the government, as this would not assist Sunnis in passing important legislation. Nevertheless, the threat of a boycott is a serious demonstration of Sunni dissatisfaction with PM Abadi’s government, the persistent marginalization of Sunnis within government, and the ability of Iraqi Shi’a militias to operate nearly unchecked in Sunni areas of the country. Moreover, Sunni politicians may escalate their demands if human rights violations by Iraqi Shi’a militias continue or if Shi’a parties continue to block legislation prioritized by Sunni parties in the Council of Representatives. Key Takeaway: The Russian air campaign enabled additional battlefield gains by the Syrian regime from January 8 to January 14, providing increased leverage to the regime ahead of negotiations between pro- and anti-Assad elements on January 25. Pro-regime forces seized the town of Salma in Northeastern Latakia Province with the support of as many as 200 Russian airstrikes on January 12. Salma has been consistently targeted by Russian airstrikes over the past three months, which began hitting the town as early as October 6. The seizure of Salma will enable further clearing operations against the armed opposition in Northeastern Latakia as pro-regime forces continue efforts to buffer the regime’s coastal stronghold. Pro-regime forces will likely take additional measures to degrade the capability of the armed opposition ahead of negotiations by intensifying advances on core opposition-held terrain in Idlib, Northern Homs, and Damascus, in addition to expanding and securing regime strongholds. The regime tightened its siege on the opposition-held pocket in Northern Homs Province on January 12, seizing the village of Jarjisah northwest of Rastan amidst heavy Russian airstrikes on opposition positions in the area. The seizure of Jarjisah reportedly severed the last opposition supply route into the area, completing the besiegement of roughly 250,000 civilians that currently reside there. Russia released the text of the August 26 agreement between Russian and Syrian officials that transferred control of the Bassel al-Assad airbase to Russia. The released text indicates that the agreement transferred control of Bassel al-Assad airport indefinitely and can only be officially terminated one year after a written request is submitted by either party. Russia’s publication of the text of this agreement clearly signals its intent to maintain military presence in Syria over the medium term regardless of the outcome of the January 25 negotiations. The Russian Ministry of Defense (MoD) also published footage of Russian and Syrian warplanes carrying out their first joint mission over Syria on January 14, a clear show of force for the Syrian opposition. The joint mission also demonstrates growing coordinative capabilities between the Syrian and Russian air forces, likely signaling deepened cooperation to come. 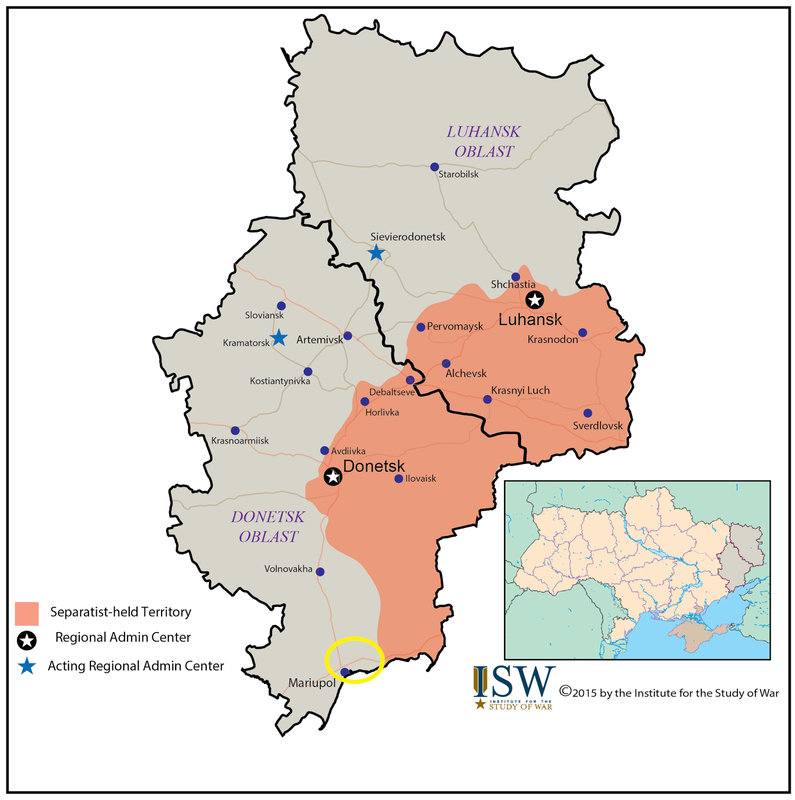 Russian-backed separatists demonstrated the Kremlin’s continued capability to escalate offensive operations in eastern Ukraine with a tactical advance into the uncontrolled village of Kominternove despite its intervention in Syria. An armored group of roughly 100 Russian-backed separatists seized the village on December 22. Kominternove lies ten kilometers outside the key Ukrainian port city of Mariupol. Separatist forces reportedly launched the operation as retaliation for Ukraine’s occupation of at least two uncontrolled villages east of Mariupol in early December, a move which both Russian and separatist officials claimed could lead to a resumption of hostilities. The advance of separatist mechanized units toward Mariupol is a direct violation of the most recent withdrawal agreement between Ukrainian and Russian-backed forces signed in September. Ukrainian authorities called the occupation of the village a large-scale provocation. The Ukrainian military has reported several incidents of shelling from the separatists' new positions around Kominternove on the neighboring uncontrolled village of Vodiane, located three kilometers closer to Mariupol. These advances underscore the potential for further separatist activity around the strategic port city, targeting weakly defended or uncontrolled villages between Ukrainian and separatist lines.